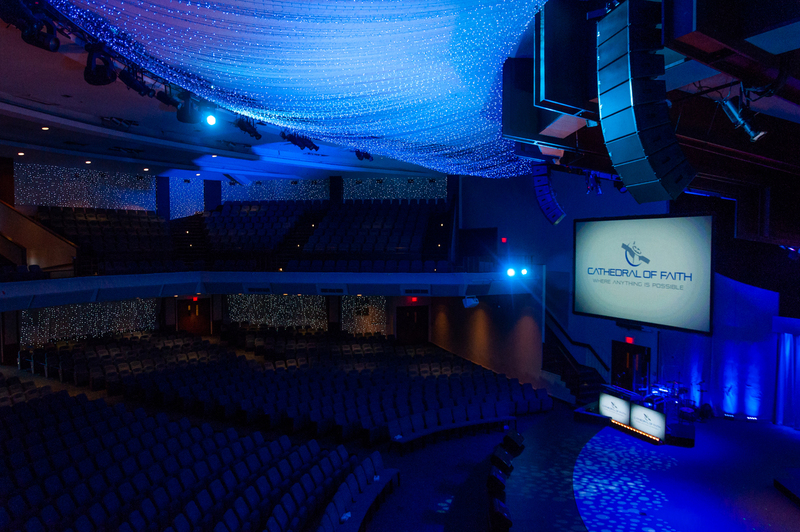 Sound Image recently installed a Martin Audio Wavefront Precision system as part of an ongoing AV upgrade at the popular Cathedral of Faith in San Jose, CA. Asked about the upgrade, Technical Director Pastor Rick Robinson, says, “The building was built in 1983 by our Senior Pastor’s father who is very evangelistic with a completely different preaching style from his son, who is a cross between C.S. Lewis and Walt Disney in his presentations. The most noticeable difference was the intelligibility and even coverage throughout the space. To solve these problems, the Cathedral staff, Sound Image and a team from Martin Audio came up with a comprehensive system including eight flown Wavefront Precision Compact (WPC) cabinets on each side of the stage, two of the original subs flown in the ceiling for the balcony, and four SX218 subwoofers, two side by side per side, under stage extensions beneath the line arrays. The Martin Audio solution also includes two WPM cabinets per side for balcony fills, six CDD5’s under the front stage thrusters for lip fills and two CDD12’s for under balcony fills. The system is powered by six Martin Audio iK42 4-channel amps for the arrays and one iK81 eight-channel amp for the subs with two-box resolution to achieve optimum coverage and control, all with Dante capability for more flexible networking. Cathedral Audio Engineer Roberta Starr adds, “the most noticeable difference was the intelligibility and even coverage throughout the space. And articulation is a very big deal because of the message in terms of speech and the music where you want to hear the distinction between different instruments. There was a lack of compromise with Martin Audio because the placement of the original PA cluster was too far above and behind the talent and we had to tweak out certain frequencies from the bottom boxes to avoid feedback and it never sounded as good on the floor as it did in the balcony where we were mixing. Pastor Rick concludes, “We also have adult and children’s choirs that range from 60 to 70 people along with Christmas and Easter productions featuring large ensemble casts of over 200 people. We all feel the Martin Audio system is really clear and sounds very good. It has brought us into a whole different level of sound for our sanctuary.